With the first month in the books, I feel like I’ve been playing catch-up from the get-go. You might recall last month, I started the new year sick as a dog and it knocked me through an absolute loop. When you don’t feel your best, it’s tough to find motivation to get a jumpstart on those resolutions. The entire month was spent with an anxiousness feeling I couldn’t shake. Our trip to Prague/Budapest is right on the doorstep and I’ve felt overwhelmed for not being as prepared as I have been with our past trips. Ryan is normally the one who plans our itineraries, and we haven’t booked/planned a single thing yet! We still have two weeks before we head out, but I also haven’t been helping my case by reassuring myself and prepping the things I can on my end. While being sick, it gave me a lot of time for some self-reflection and some areas that I should improve on. Admittedly, I was pretty selfish last year and didn’t check in on friends as often as I wanted. In 2019, I’ve made a mental note to check in more with those close to me, accept more plans with friends and step out of my comfort zone. I started the month celebrating one of my best friend’s birthdays and having a night of letting loose and having the sobering realization that I can’t party like I used to! I ended the month with Ryan and our good friend, Corinne as we headed to New Hampshire to check out a few meaderies and indulge in some Mexican, along with plenty of laughs shared. Also with being sick, it put a major hinderance on my fitness goals. Once I finally felt decent enough to sweat it out at the gym, it wasn’t before long that I was sidelined with a lingering ankle sprain from December. I’ve been shelved for about two weeks now, since it still hasn’t fully healed and only recently have resumed light workouts, like yoga. January was essentially a trail month. I often joke about the resolutioners that fall off the bandwagon, but I really felt as if my wheels were spinning in the mud and no matter what I did, I couldn’t get a good grip on my goals. Already with February being interrupted with our trip, I feel like my goals won’t really hit the ground running until after the trip. 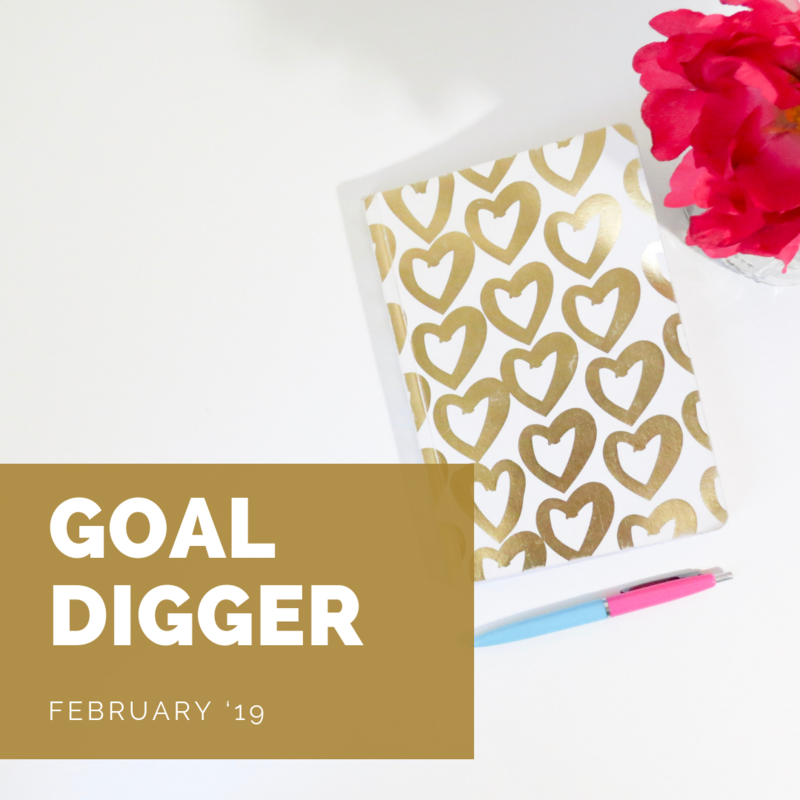 Accountability has been one of my focal points this year, so it’s time to crack down, quit making excuses and grab February by the reigns. Practice self-love: Last year, I wrote a post about self-love and what it meant to me. As the year progressed, I learned that it’s not always about indulging with sheet masks or taking bubble baths. Rather, it’s about putting the right things in your body to make it strong, surrounding yourself with the right people who only want to see you prosper and clearing that toxic headspace. By nature, I am a very self-depreciating person and I often only see the worse in me. What better time to try and break that habit than during the month of love? Ideally, I want to do little things daily to promote a positive self-image of myself, like journaling, and maybe splurge on the big day to show myself how valuable I truly am, even when I don’t feel it. Spread love: Tis the season for love, after all! As mentioned earlier, I was really selfish last year and spent a lot of time to myself. I do have a big heart, despite my sometimes stand-off persona and I want to acknowledge that love is so important. There’s a lot of hate in this world nowadays and I want to remind others that there still is a little good in everyone and I want to try and unbury it. While I was writing this post, I was browsing on Facebook and saw that you can send valentines to children at Cincinnati Children’s Hospital, and immediately I decided to do this! You can send a valentine to a child (for free) here! Stay patient with goals: Understandably, the year hasn’t been good in terms of my rate of success. Actually, my rate of success has been pretty abysmal the more I think about it! The more I look at it, the more I realize that I have been very lax with myself and have been making a lot of excuses lately. In order to be successful, I need to regroup and refocus, but also not punish myself if I don’t cross everything off my to-do list daily. Instead of abandoning all hope, I need to stay patient and roll through the motions and check in every so often to see where I need to improve. Create online class schedule: Recently, I have been getting into the habit of creating checklists, schedules and other things to become more consistent with the goals I’ve created at work, as well as with this website. One of my resolutions for the year was to create a schedule for those online classes and we all know that if I’m going to do something, I have to write it down 15 times in order to get it done! Once I create the schedule that works best for me, I’ll start chipping away at the curriculum. This entry was posted in lifestyle and tagged #blogger, bbloggers, beauty blog, blog chat, blogger girl, blogger life, blogger lovin, blogger style, bloggers, blogging, blogging gals, blogging tips, fashion blog, fbloggers, goal crusher, goal digger, goal driven, goal oriented, goals, life with sarah, lifestyle blog, on the blog, sarah lokker, sarahhlokk, savvy blogging. Bookmark the permalink.